The mature spore of the perennial climbing fern Lygodium japonicum (Thunb.) sw. of family Lygodiaceae. In Guangdong and Zhejiang provinces, etc. Collected the leaf in autumn when the spore is mature but not falling. Slight smell and bland in taste. Dry, yellow-brownish, light and smooth, able to float in water, no impurity, sound can be heard when it is fired. Get rid of impurity and unprocessed. Sweet, bland and cold; bladder and small intestine meridians entered. Induce diuresis to treat stranguria. It has the actions of clearing damp-heat from bladder and small intestine. It is good at inducing diuresis to treat stranguria and alleviating pain in urinary tract, so it is the essential herb for all stranguria syndromes. It should be combined with other herbs to strengthen the curative effect according to syndromes. 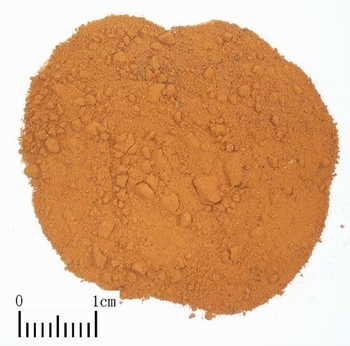 For heat-stranguria with acute pain, it is ground into powder and taken with Gan Cao decoction to increase the actions of clearing heat and treating stranguria in Quan Zhou Ben Cao (Materia Medica of Quanzhou). For blood-stranguria, it can be used with the herbs of clearing heat and inducing diuresis, cooling blood and stopping bleeding such as Xiao Ji, Bai Mao Gen and Shi Wei. For urolithic stranguria, it can be used with Ji Nei Jin and Jin Qian Cao to treat stranguria and remove stone. Additionally, it can also induce diuresis to alleviate edema. For edema, it is usually combined with Ze Xie, Zhu Ling and Fang Feng to strengthen the actions of inducing diuresis to alleviate edema. Decoct 6~15 g. It should be decocted with wrapping.